If you’re considering a built-in grill for your backyard patio or deck, the Hasty Bake 290 SS Built-in Charcoal Grill is an excellent choice. This fabulous grill offers ample cooking space and two different controlled fireboxes to help you get the perfect dinner cooked on time. Whether you want to cook for a bunch of your family and friends or just your special someone, this is the grill to do both. You can cook for a party on the over 1,100-square inches of space or you can heat up one side to do a smaller batch. With a durable stainless-steel construction and a 10-year warranty, you’re sure to love this built-in addition to your backyard kitchen. Cooking on a grill is a favorite of many around the country and one problem that they face is having enough room to cook for a large group. The Hasty Bake Built-in Charcoal Grill tackles that problem head on with a large space to cook all your favorite meats and vegetables. The total cooking space is over 1100 square inches of solid cooking area. You can cook a variety of foods at the same time to make sure that all the food is done on time, every time. You can easily grill up some steaks, hot dogs and burgers, or shish-kabobs while your veggies are cooking as well. Pull everything off at the same time for a hot and delicious grilled meal. When you’re cooking on the grill, you want to have the control of the heat in your hands. You need to know that when you adjust charcoal or firebox areas, they are going to work how you need them to. That’s exactly what the Hasty Bake 290 offers you. On the grill, you’ll have two different fireboxes that are each individually controlled separately from the other. You can conduct direct cooking at the same time that you have indirect cooking going on. This allows you to truly slow cook your meats and heat your veggies at the same time or sear an item when another is getting the residual heat. There are a few reviews on Amazon about the Hasty Bake 290 SS Built-in Charcoal Grill and they are all positive reviews – a solid 5.0 out of 5 stars! So far, everyone who has purchased this grill loves how easy it is to cook a variety of food options at the same time. One of the biggest downsides to the Hasty Back 290 is the cost of the item. At well over $3,000 on Amazon, it can be a large amount of money to put down on one grilling item. As one reviewer commented, this type of grill is not for the faint of heart. It is more for those who are avid grillers and want the best of the best when it comes to the charcoal grilling experience. Those who reviewed the grill had this to say … “For people who are serious about charcoal grilling” … “Amazing control of every facet of cooking” … “It is built like a tank” … “Perfect grill”. 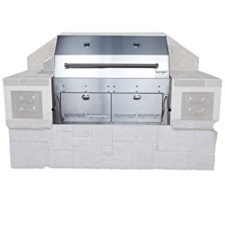 In conclusion, the Hasty Bake 290 SS Built-in Charcoal Grill is a perfect addition for the avid outdoor cooker. If you’re wanting to create a beautiful atmosphere in the backyard, on your patio, or your deck, this is the perfect built-in addition. You can create a totally unique atmosphere by building a rock wall display around the grill and enjoying many summer evenings in the backyard. The biggest obstacle, however, may be the cost of this grill. It is pretty steep so you must be absolutely invested in this type of cooking to warrant the cost of the grill. It can cost a pretty penny so it truly is for those who are avid grillers and those who will get the most use out of a purchase such as this. If you’re ready to start charcoal grilling for years to come, this is the grill for you!